Mothers Day is fast approaching and trying to find the right type of gift can be a daunting task for many people. Especially for sons who are trying to find gifts for their mothers. Or Husbands buy a gift to show their appreciation. Many guys typically have a hard time giving their moms gifts because pleasing a mother can sometimes be a difficult thing to do. Besides, a lot of women with kids tend to have a lot of possessions. Trying to give her something that she already does not have can also be complicated. While many moms appreciate traditional gifts such as flowers, cards, elegant dinners and stylish dresses; they probably would prefer to have an electronic tablet device such as a Kindle. Here are some Kindle gift ideas that many women would appreciate on Mothers Day. A lot of women like to read and many of them do appreciate a good novel. One thing that sons (and daughters) can do is purchase a Kindle Paperwhite for their moms on Mothers Day. A Paperwhite is an eBook reader that is designed specifically for reading electronic novels, magazines, newspapers and documents. The anti-glare screen allows mom’s to sit outside on a bright and sunny day and read their Paperwhite device without any problems. This particular eReader has also been designed not to strain a person’s eyes while they read in the dark. The Paperwhite device will not require a mom to charge it up everyday. This tablet has the ability to keep a charge between six and eight weeks. The Paperwhite is also easy to hold since its thinner than a standard size pencil and lighter than a standard tablet. The Kindle can also hold hundreds of books which means that mom will never run out of reading material from her own personalized library that she can carry around with her. The Kindle HD is another top selling mobile device that is sure to please moms. 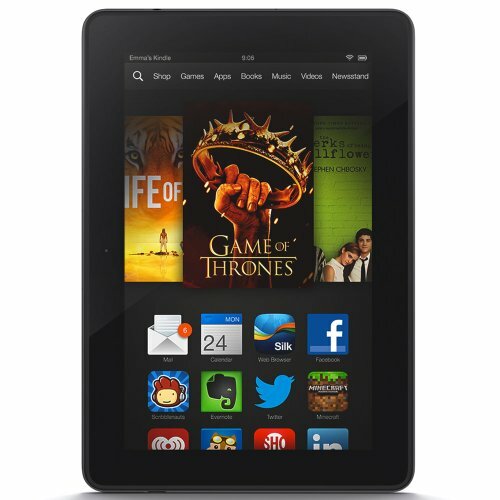 Kindle HD is a tablet that allows moms to watch videos, surf the web, interact with social sites and to play games. Stay at home moms who have to manage their household will really love taking care of the home front with a Kindle HD by her side. They can watch their favorite shows while cleaning up the kitchen or doing the laundry. They can also view recipes from their tablet while making a meal or even use their Kindle HD to download children’s books to read to their kids during bedtime. The HD also plays music, takes and stores photos and provides mom with a wide variety of applications that can help them to manage their finances and find coupons and special offers on products and services. The Kindle HD is a great device that will provide mom’s with loads of entertainment and fun for hours on end. Sons and daughters should also think about getting their mom’s a Kindle HDX which is a Kindle with power and performance than the HD. The HDX will give moms more storage space for her videos and more power to run her favorite apps. The HDX has an upgraded screen that displays crisp and sharp images. Moms can use the HDX to entertain their fussy and busy children and they can even carry it to the park when they take their kids and pets out for a walk. Kindle tablets and eReaders have a variety of accessories which will help a mother to protect their device and to use it more efficiently. There are a variety of different covers that a mother can use for their Kindle device. Manufacturers make just about any type of Kindle case that could be imagined. Women that like the color pink can get a pink polka dot Kindle cover or a yellow cover with lots of spring flowers. Some businesses will even customize an eBook cover according to a person’s specification. Tablet stands, headphones, speakers and USB cords are other accessories that can be used with the Kindle. Kindle gift ideas for Mothers Day would be even better when they are loaded with mom’s favorite applications and eBooks. There are many different types of applications that mothers will appreciate for Mothers Day. Coupon apps are great because they help moms to save money on shopping and buying goods for their families. A photo book app will make a good program for moms because it allows them save, edit and store precious photos. Cooking apps will help moms to create new meals and recipes and movie applications will allow moms to watch her favorite shows and videos on the go. Loading the applications onto a device is a great way to surprise a mom on her special day. Here are some other reasons why Kindles should be given to people on Mothers Day. Kindle devices last longer than many other types of gifts that mothers receive during the holiday. A Kindle device is a great way to keep a lady entertained and connected to the world. When a mom has a Kindle device it is a great tool for keeping little ones preoccupied while they are running errands or waiting at the doctor’s office. Kindle products are easy to set up and use. They require a very small learning curve and the products are fairly durable devices that can withstand most falls, impacts and spills. Kindle gift ideas for Mothers Day is a great way for people show their moms how much she is appreciated and how much she is loved.